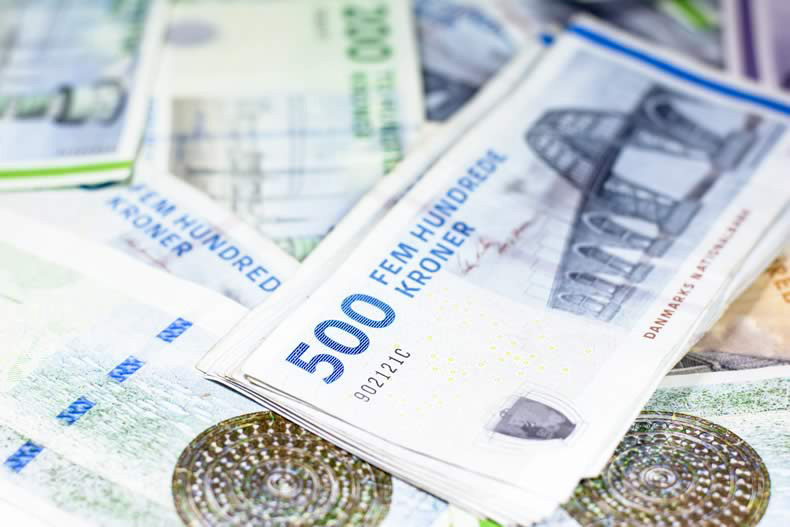 The Danish Krone is the official currency of the Kingdom of Denmark, Greenland and the Faroe Islands. The currency is represented by the symbol kr. and by the ISO code DKK. The Krone is subdivided into 100 øre. The banknotes and coins are issued by the Danmarks Nationalbank. The banknotes of 50, 100, 200, 500, 1000 Kroner and coins of 50øre, 1, 2, 5, 10, 20 Kroner are issued by the Danmarks Nationalbank. The Danish Krone has an exchange value of 10-11 Indian Rupees. Check the live rates of Danish Krone against the Indian Rupee here. The Danish Krone is used as itself in Denmark and Greenland only. The Faroe Islands have a special version called Faroese króna and in Greenland, there is a special series of Danish Krone issued by the Danmarks Nationalbank. Denmark is a country in the Northern Europe to the south of Norway. Denmark is a constitutional monarchy with Queen Margrethe as the head of state. The nation has one of the world's highest minimum wages. Trade unions are present throughout the nation ensuring workers benefits and upholding their rights. Denmark is a Scandinavian nation with some Viking history. The Danish economy is maintained by various exports and trades. Agriculture was the key income source for the Danish, now they have expanded over to many industries such as iron and steel, chemicals and so on. Denmark also exports oil and gas. Food products are the key export of Denmark. The United States Dollar is valued at 6-7 Danish Kroners. The Danish Kroner can be bought or sold in major financial institutions across India. Denmark is one of the most visited tourist destinations and also a place for job seekers. Whenever you are travelling to Denmark it is always best to convert Indian Rupee to Danish Krone from India itself as the Indian Rupee may not be accepted elsewhere. Besides, it will save you some amount through exchange rates and also in time. Converting INR to Danish Kroner from India can help you get better exchange rates. Since the Indian currency has fewer chances of being accepted in Denmark it is best to convert INR to DKK from India itself. ExTravelMoney.com is an online marketplace that can help you locate the best exchange rates for currency exchange. Find the vendors in your region and place the order for currency with us. With the help of our customer care executive complete the order and make the payment online. Fo saving you time, you can even request the vendor to deliver the forex to your home and pick up the KYC documents. The Danish Kroner can be easily exchanged for Indian Rupee. Converting the Danish Kroner into INR in India can get you the best exchange rates. ExTravelMoney.com can help you locate the vendor nearest to you along with the exchange rates that they offer for Danish Krone. Find the right vendor and place the order online. Then you will be contacted by one of customer service executives. Confirm the order with us and you can even request the vendor to pick up the forex and KYC documents from your location. If you are looking for an easy and hassle-free service to send money from India to Denmark, ExTravelMoney.com can be at your service. Send money abroad easily with simple steps and with the support of our dedicated customer service executives. Our vast network of vendors can help you send money with peace of mind. Place the order for wire transfer online by finding the suitable vendor near you. Then complete the procedures and confirm the order with our support team. Then the transaction will be processed by the banks and the beneficiary will receive the funds within 3 days depending on the difference in time zones.